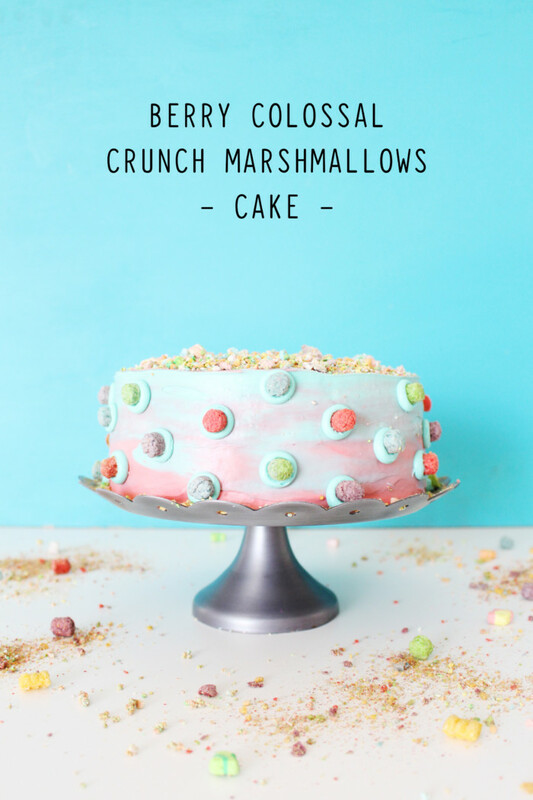 Go ahead, add one the most indulgent cereals ever to cake and why not top it with crushed marshmallows and colorful marbled frosting too? 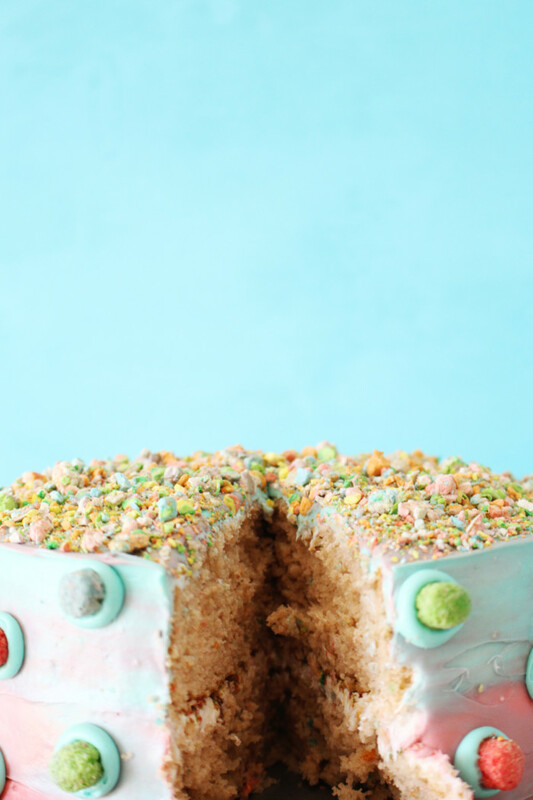 This recipe for Berry Colossal Crunch cake with Marshmallows and Marbled frosting will win over everyone. 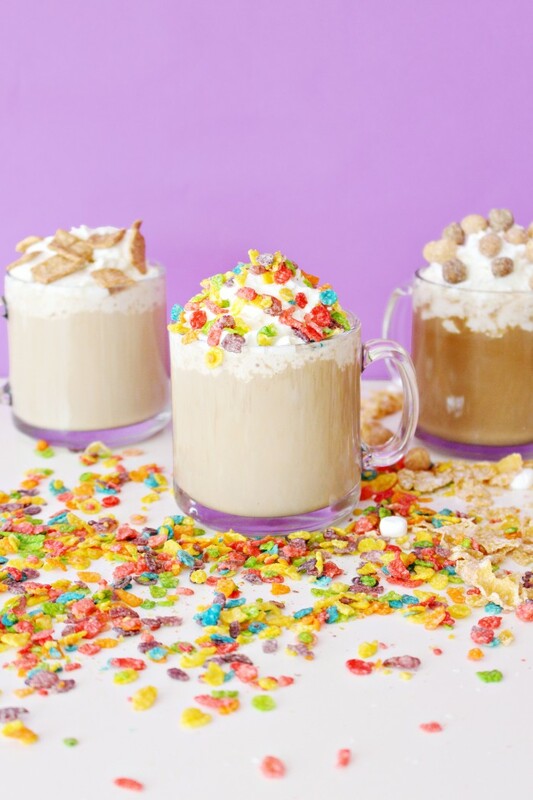 For the longest time I thought Fruity Pebbles were my favorite cereal, followed closely by Cap’n Crunch Berries, Cinnamon Life and Cinnamon Toast Crunch (I obviously like the grown up healthy kind of cereals…). But now I know, that one cereal is far and above even all of those ^ amazing cereals. And It’s not even a “name brand”. It’s actually a Malt O’ Meal cereal. I am talking about Berry Colossal Crunch with Marshmallows. Honestly, I normally wouldn’t give a knock-off cereal this much attention because I believe the company who invented the original amazingness deserves the props. 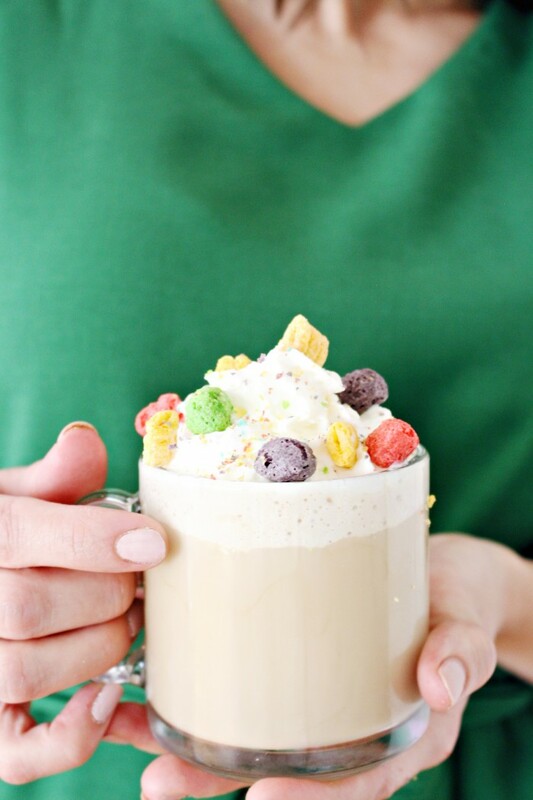 But they went ahead and took Cap’n Crunch and ADDED MARSHMALLOWS. So I think they deserve a little (or a lot of) praise. 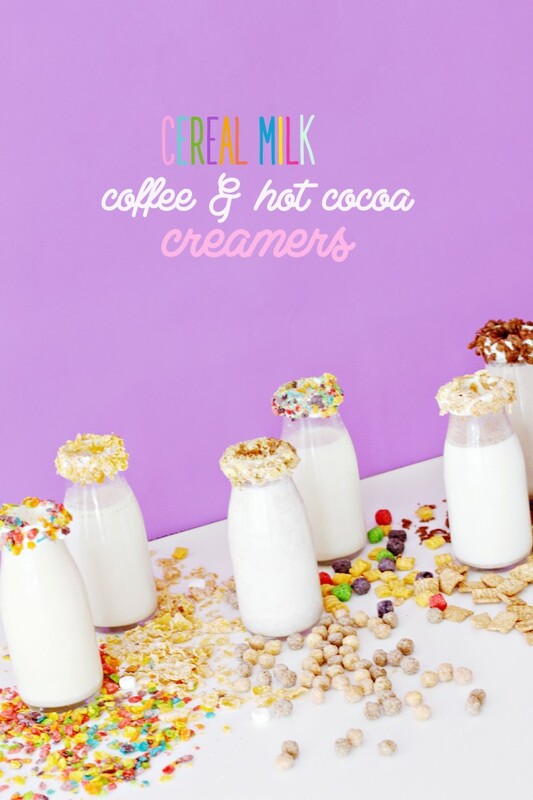 There is literally nothing better than cereal marshmallows. What are they even!? I think they’re dehydrated marshmallows but I’m pretty sure if I dried out some regular mallows they wouldn’t come out tasting like that…of course nothing homemade does taste like the store bought version, which is usually a good thing and some kind of indication that your version is healthier. But, if I’m going to take the time to dry out marshmallows and if I’m looking to fill a cereal marshmallow void of some kind, I want them to taste like the actual thing. But I’m getting a little off topic here. The point is, I definitely wan’t five 1 lb bags of cereal marshmallows if anyone wants to buy that for me, please and thank you, and adding those marshmallows to one of the already best cereals of all time is just HEAVEN. IN. A. BOWL. The first time I tried it, I immediately had three bowls. I’m not saying this is a good thing ok. And I don’t encourage you to be like me. BUT, seriously, if you like sweet cereal then you have to grab a bag of Berry Colossal Crunch with Marshmallows. 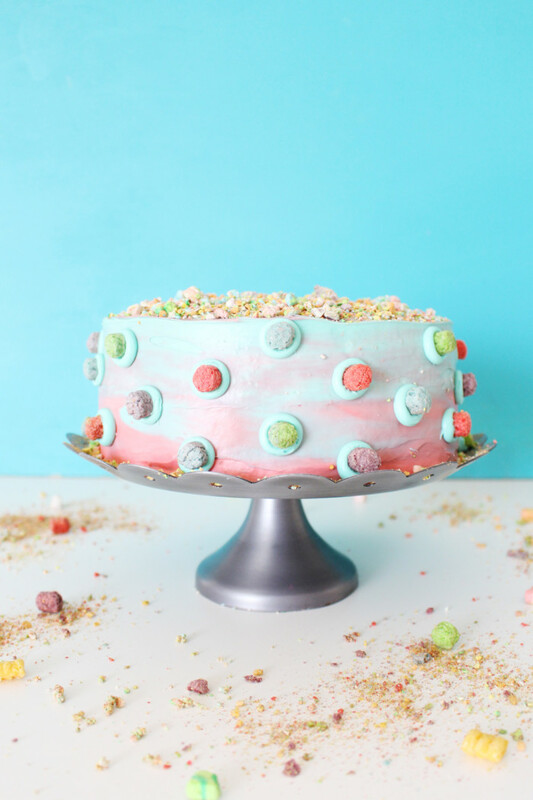 And if you’re also like me in that you love desserts and colorful ones at that and are always looking for fun ways to jazz up your typical everyday cake, then go ahead and use some of that cereal you just bought to make this colossally fun and sweet cake! Isn’t it just such a fun looking treat?! I love it! 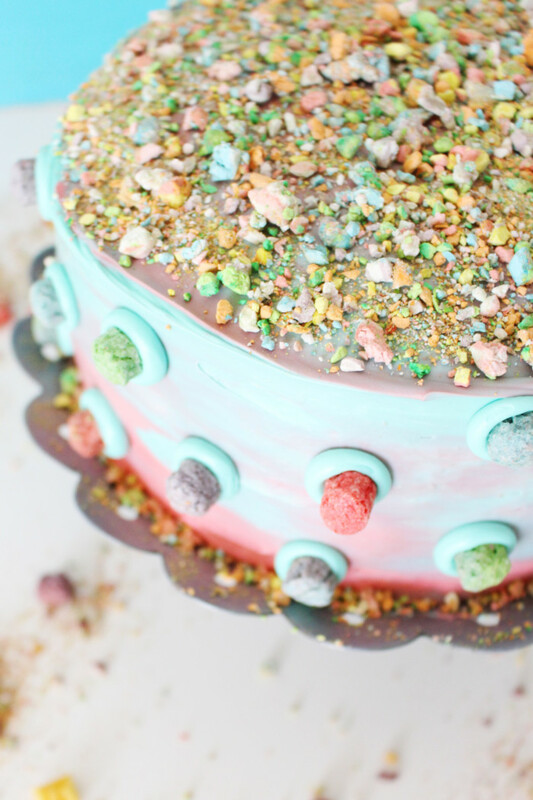 I want to make if for everyones birthdays even if they hate cake and/or cereal! 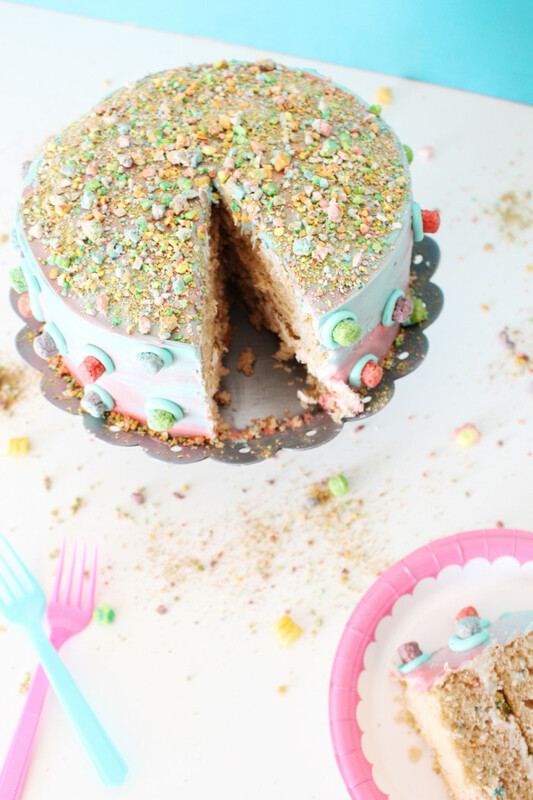 I even figured out how to give this baby a colorful marbled frosting (which was oh so easy!) 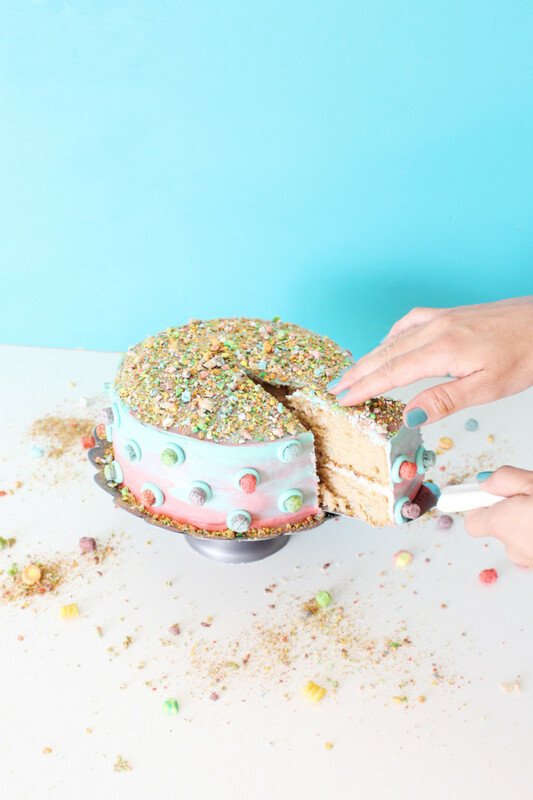 to add even more pizazz and I can’t wait to add that feature to many more cakes, regardless of whether or not they include copious amounts of sugary cereal. 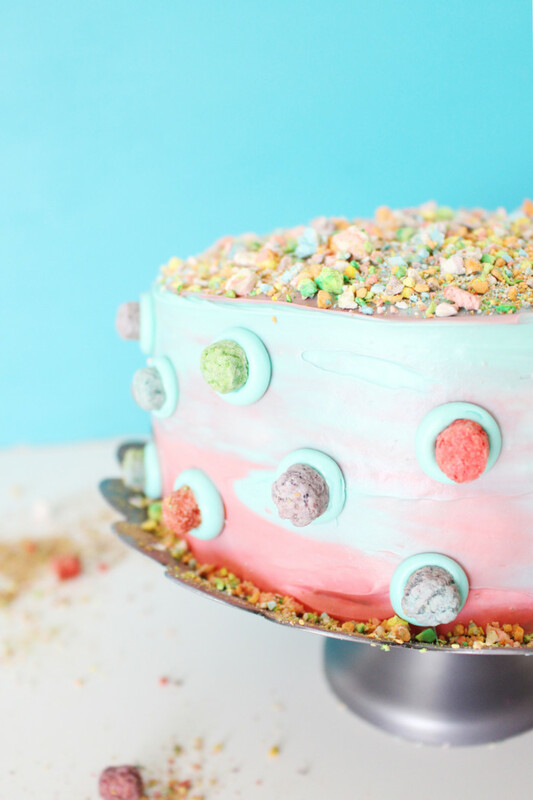 This cake has Berry Crunch in, on and around it. It can’t stop. Just like me. 1. For the cake we used two 9″ pans. We also used a box mix with an extra egg and butter instead of oil as well as 1/4 cup of sprinkles added for extra color. Also add 1 1/2 cups of cereal powdered (so it ends up being about a cup of powdered cereal) to your batter and mix it all together and bake. 2. Once cooled, remove cakes from pan, level them out (I freeze my cakes for at least a day first) and then add a layer of frosting in between the layers (we used pillsbury canned frosting in fluffy marshmallow flavor. I secretly hate buttercream in every way, especially making it, but I know I’m alone in this so use a recipe for that if you wish!) and a layer of crushed (doesn’t need to be powdered) cereal on top of that frosting before adding the second layer of cake. 3. Frost your cake with a crumb coat. Just a thin layer of frosting to keep it altogether and stop crumbs from getting on the outside of your finished cake. 4. Once crumb coat is set (I put the cake in the fridge for at least an hour) you can begin the marbled frosting layer. 5. Divide a can of frosting in half and add desired food coloring to get the two colors you want to use. We did teal and bright pink (3 drops blue with 2 drops green and 7 drops red). 6. Frost the bottom half of your cake with one color. 7. Frost top and top half of sides with the other color, coming down a bit. 8. Now just spread the frosting around the cake using a flat spatula or knife. The colors will mix together naturally but you can help them a long by adding a bit of the opposite color onto that side of the cake. Also add the opposite color to the top in dabs and swirl that around. Easy! 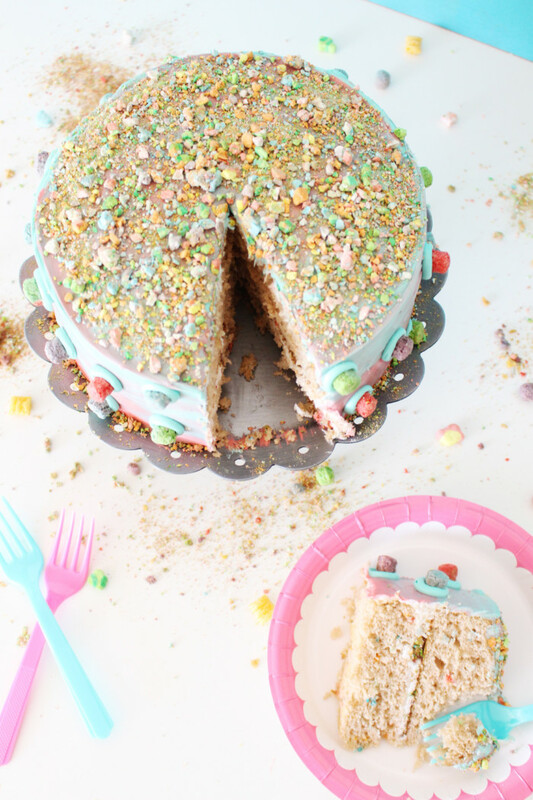 To finish decorating, I piped dots of frosting all around the cake and pressed in berry cereals. I then divided out a bunch of the marshmallows from the cereal and crushed those in a little baggy before dumping them on top of the cake and around the bottom edges. This cake was truly such a treat and really my type of yumminess! If you’re one of those people that feels confused anytime someone says “it was just too sweet for me” then this cake is for you ;) No, really, its not any sweeter than your typical birthday cake but it’s so much more fun! 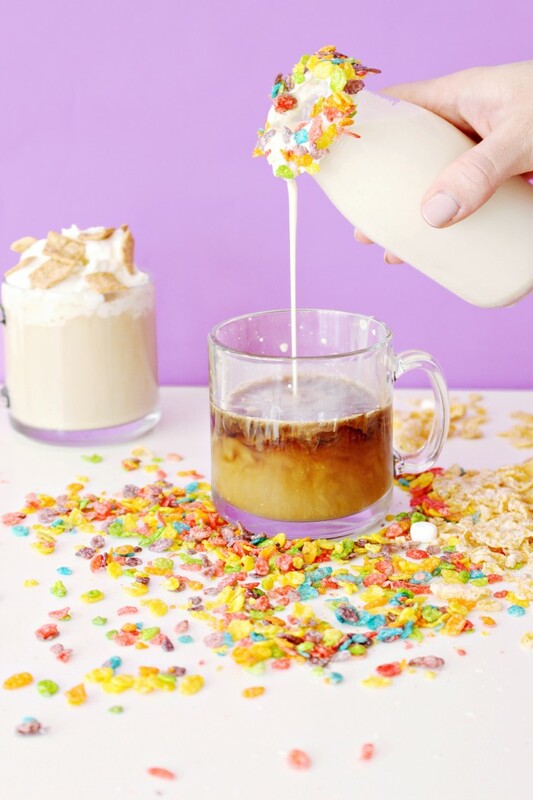 You could personalize it further by using whatever the birthday person’s favorite cereal is instead, but, unless they haven’t tried this kind yet, this is probably it.